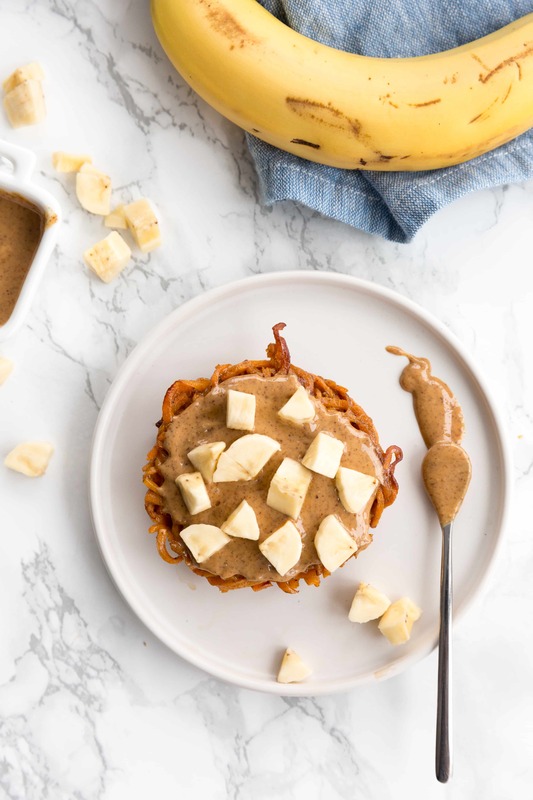 This gluten-free and spiralized twist on toast with almond butter and banana uses spiralized sweet potatoes as a noodle bun, cooked in coconut oil for extra sweetness and bound together with an egg for extra protein. 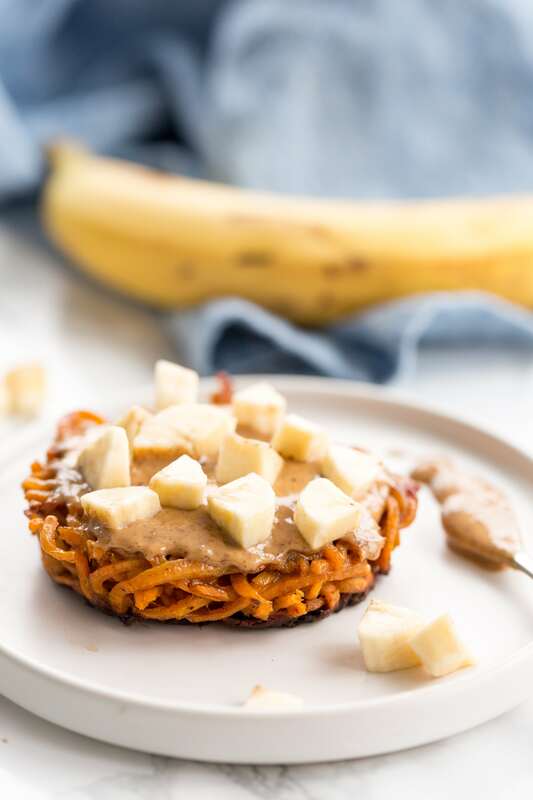 Whether you’re grain free and looking for a way to replace toast or an English muffin, just want to try something new, or are trying to squeeze in more vegetables in your day, these spiralized sweet potato noodle buns are for you. The sweet potato noodle bun was created by me after seeing the ramen noodle bun craze in Brooklyn a few years ago. In an effort to make a healthy version, I spiralized sweet potato, cooked the noodles, tossed them with egg, and seared them in a skillet until bun like. It worked! Now, I love using spiralized noodle buns as a sandwich base, a pizza base, as a breakfast side, or like here, as a toast or muffin substitute! One of my favorite snacks and breakfast foods is toast with almond butter and banana and this is a fun, veggie-packed twist. Bonus points: it’s toddler approved! For a helpful video and refresher on how to make this gluten-free sweet potato noodle bun, click here. Heat a medium nonstick skillet over medium heat. Once heated, add the sweet potato noodles and season with salt, pepper, and cinnamon. Cover and cook, uncovering to toss occasionally, for 5-7 minutes or until noodles are softened. ?Transfer the cooked sweet potato noodles in a medium bowl, allow to cool for 3 minutes, then add in the eggs. Toss to coat. ?Fill four 6-ounce ramekins (or similar) halfway with the noodles. Cover each with a piece of foil or parchment paper and push it so that it’s directly touching the noodles. Place a can or similar heavy item over the foil and press firmly to compress. If you have time, refrigerate for 10-15 minutes so that the noodles set. Heat the oil in the same skillet used to cook the sweet potato noodles. Once the oil is shimmering, add in all of the buns, flipping each ramekin over the skillet and patting the bottom until the bun falls out. ?Cook for 5 minutes or until noodles set, being sure to push in any stray noodles. Then, carefully flip and cook another 5 minutes or until the bun is completely set and browned, flattening with the back of the spatula. Transfer to a cutting board and let sit for 2-3 minutes to lightly cool. Spread the tops of the buns with about 1 tablespoon of almond butter each and top with banana slices. Oh, probably almond butter, although the chocolate hazelnut is mighty tasty! Vanilla butter is one I haven't tried yet so that would be the one I would try. I love all the other flavors. I agree Justin's is the best. Thanks for another great recipe cant wait to try it. A scoop from the jar is my post exercise snack too....it's addicting! I love the chocolate hazelnut. Amazing! Those are amazing. I cannot wait for your book. You are so inspiring (and inspiralizing, lol!). Is there a way to make the bun without the egg? Thank you for the kind note, Tiffany! It's a hard call between chocolate or Vanilla almond butter. I'm going to have to try both! I couldn't imagine how the spiral slicer would make a cinnamon bun but you never cease to amaze me. It looks tantalizing to say the least. I would choose Justin's Classic Almond Butter. I've never tried the vanilla flavors and would love to! I'm in love with their maple almond butter! Chocolate Almond Butter, hands down! :) The Vanilla sounds interesting too. That Inspiralized Bun looks amazing and you can't go wrong when you top anything with nut butter and honey! Chocolate Hazelnut alllll the way! I love hazelnut and haven't seen this one until now. My go to for breakfasts always include nut butters. Can't wait to try this recipe. Thanks so much for all your posts. I actually bought one of these and had no idea what to make until finding you on Pinterest. I'd try the honey almond one- sounds so good! This bun looks sooo good. You've convinced me that I need a spiralizer. I would love to try out chocolate hazelnut and vanilla almond! Honey almond, vanilla almond, or maple almond - such a tough choice to pick just one! Straight up classic almond butter will always win me over! I'd get the regular almond butter! I'd like to try the maple almond butter. Your breakfast "treat" looks delicious! I make my own banana nut bread which I eat for lunch everyday. It's not vegan but it is healthy. I've substituted out the oil and sugar for applesauce and Greek yogurt. I use quinoa flour and add chia seeds, flaxseeds, walnuts and some dark chocolate (helps to satisfy my insatiable sweet tooth). I guess the reason I am telling you this is that I cut off a slice, add a smear of nut butter, chopped banana and honey...much like your wonderful creation. I am really going to try your recipe. When I was growing up I wouldn't touch a sweet potato, now I could eat them a few times a week! My "super-bread" has also helped me in my marathon training, on those long runs it gives me something to look forward to when I get home, much like a cold shower in the summer! I'll be running my first ultra in less than two weeks, the JFK 50, hopefully my training and diet regimen will pay off with a respectable finish. Congratulations! An Ultra?! That's impressive - I did a San Francisco marathon in 2013 and I still haven't recovered! Good luck and thanks for the comment. I am eating totally Paleo now and this recipe falls under my Paleo guidelines.....I made the bun itself this afternoon and after dinner tonight I just couldn't wait to try it so it ended up being my dessert instead! OMgoodness......can it get any better than this? I think not!!! You have no idea what a hapyp happy girl I am tonight after eating this! I also made the Butternut Squash with browned ghee & sage except subsituted turnip for the squash, no problem spiralizing the turnip and oh sooooooooo good! Love your recipes, esp. the ones that are Paleo friendly (even if by accident by you)!! Thank you so much for the kind words and good luck with your new Paleo lifestyle, it's certainly a healthy choice! this sounds amazing! I love the bun! I would try out the vanilla almond. Mmm....yum!! Yes! Someone who shares my passion for toast + lots of nut butter + jam + bananas! Seriously one of my favorite foods. I've never tried any of Justin's products but I'm dying to taste the vanilla almond butter or the maple almond! I am not picky. I love them all. Nut butters are my weakness. And I love your nail polish!!! I'd choose Honey Almond. The flavors sound delicious. Yay for a fellow NJ-ite! 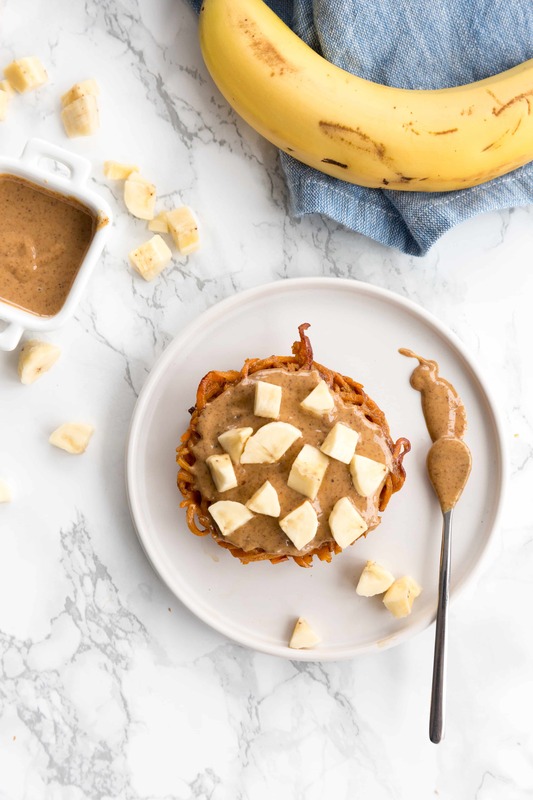 I came across your blog because I'm taking a class on spiraling tomorrow and they recommend your blog to read more about it-- this recipe looks delicious and I'm keeping my fingers crossed to win one of those vouchers! i would get honey peanut, vanilla almond, and classic almond! I like plain old plain classic almond butter! Love this idea - Justin's almond vanilla is my favorite! Yes, of course - please go ahead! Although my bun came out of the ramekin perfectly formed it rather sadly fell apart when I flipped it over... But I didn't care that it looked messy when the favours were SO delicious together omg (even just using plain old ordinary peanut butter)!! Awesome weekend brekkie that kept me going until lunch, including all the way through a one and a half hour ballet class! So happy to hear you made it work for you!